A strong local oral tradition had kept tales of Newgrange, Knowth and Dowth, the Brú na Bóinne, or place of the Boyne, alive into the 17th century. Yet the location of the passage grave had long been forgotten. It was overgrown with trees, and was rediscovered only by accident when the local landowner removed a rock in 1699 that revealed the entrance into what was thought at first sight to be a cave. This floor plan of the tomb shows an aerial view of the mound which covers just over an acre in total. The passage itself doesn't look very long on this plan, but in reality, when you have to squeeze through the narrow gap of the passage, those 20 odd meters feel like a kilometer. The passage further inside where it becomes really narrow. Squeezing through there without turning back is a spiritual challenge! Then, the passage opens up to reveal the chambers, some beautiful art work, and the beautifully crafted basins (see below) in which the human remains were originally deposited. 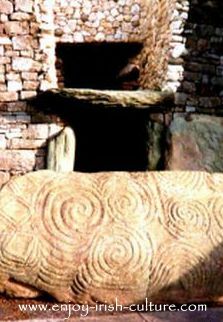 The passage grave at Newgrange is more elaborate than other tombs. 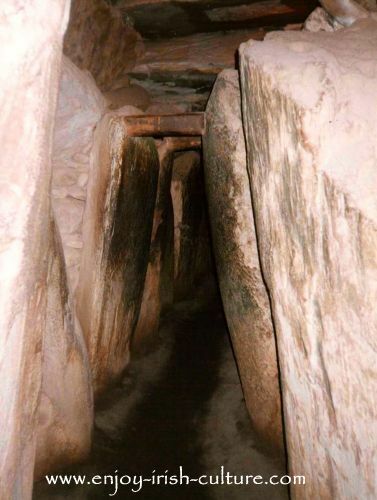 The light that is allowed into the passage on Winter Solstice enters the building not through the doorway, but rather through a gap in the entrance wall which can be seen on the photo on the right higher up, which archaeologists call the ‘roofbox’. 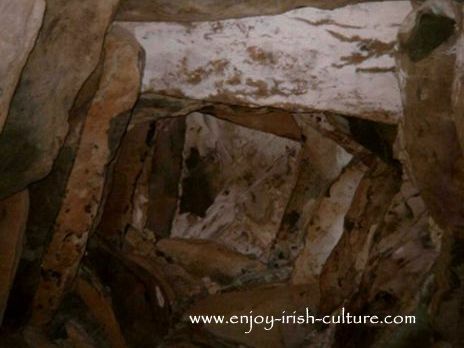 The roof box at Newgrange originally contained two large white Quartz blocks. From the scrape marks on the rocks archaeologists were able to tell that these rocks had been used to block or open the hole just like a window. This was done in order to to let in the light at the right time of the year, and to conceal the opening otherwise. The function of the roof box was discovered by Professor O' Kelly. He had picked up a local oral tradition which claimed that the roof box would let sunlight shine into the tomb at a certain time of the year, but no one knew just when this would be the case. He had a hunch that this happens at sunrise on the Winter solstice each year and confirmed it through practical testing. In 1972, an in-depth study was carried out and concluded that this was part of the original plan of the builders. Sneak peek of one of the basins which are located in the side chambers off the main passage at its' widest point. 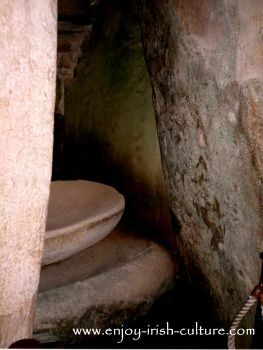 These basins in passage graves normally contain cremated human remains and some grave goods such as speer heads, jewellery, beads and in some cases, pottery. Read more about Neolithic Ireland in this two part article, part 1, and part 2. 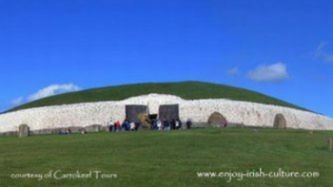 Find tourist information here on visiting the Bru Na Boinne complex which includes Newgrange. Find out about lesser known but older sister sites at Carrowkeel and Carrowmore in County Sligo. 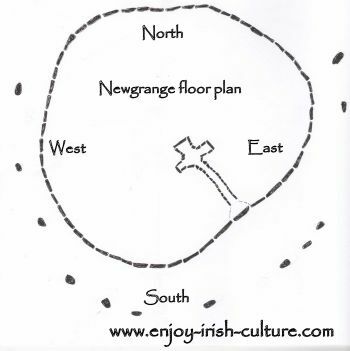 The archaeological dig at Newgrange took 13 years. It was conducted by Professor O’Kelly assisted by a team of students from Cork University. There were no documents to aid them, as an earlier excavation carried out by the Board of Public Works was undertaken in an unsystematic fashion. When the dig started in 1962, the archaeologists found evidence of looting of the tomb. A lot of archaeological evidence had been lost. For example, bones and ashes were found outside the basins where they had been deposited, mixed into the soil indicating that looters dug up the human remains in their search for treasure. The only artifacts left by the looters and found in the dig were some pendants, a flint flake, a bone chisel and some beads as well as some Roman coins near the entrance which showed that the site was known, and was probably used, into the Iron Age. Further outside finds included a gold chain, two gold torcs, and two finger rings and some more Roman coins. The skeletal remains found were from at least two separate individuals. Some features around the tomb that had been reported after the rediscovery of Newgrange in 1699 had disappeared or had been moved. For example, the only trace that could be found of a triangular standing stone which had been reported was its socket. Some of the rock belonging to the mound had been used for building purposes by the local landowner. During the excavation, the mound was stripped entirely, and then reconstructed. This was because the grave had partially collapsed. The structure was supported with concrete and steel. The beautiful corballed ceiling of the passage grave shown on the photo above will give you an impression of the level of craftmanship of the original builders, as well as of the effort involved in the excavation and reconstruction. When the passage grave was reconstructed, the quartz which had been found around the outside of the mound was used to clad the perimeter as can be seen today. This was a controversial decision. Professor Michael J. O’Kelly felt that the quartz must have fallen off the walls. Eogan, the archaeologist who excavated nearby Knowth, disagreed. In his opinion, a wall of this nature could never stay up and misrepresented the culture of the time. At Knowth, he left a similar find of quartz rock where he had found it: as a carpet around the tomb. If you enjoyed this article about one of ancient Ireland's best known sites, and if you like what we provide on Enjoy Irish Culture, please support us in growing our audience by using any of the social buttons provided on this website, either the buttons at the top left, or the sharing boxes or Facebook comment box at the very bottom. Warmest regards from Ireland from Susanna and Colm. Return to 'Irish Heritage Sites'.